CARON-Simply cast on, wrap yarn, knit-that is it! It is easy, no knowledge of knitting necessary. Using basic or novelty yarns you can make scarves, hats, purses, baby gifts, and more! Stitches remain on the knitter until they are knitted-you cannot drop stitches. Kit includes: pocket knitter, stitch lifter, instruction book, and 7 patterns. Knitter itself measures 8-7/8"x2-1/2". Available in assorted colors chosen at random. Do you have a friend, relative, child, grandchild or niece (or nephew) who's interested in learning to knit but just cannot manipulate (or have the patience for) using two needles? 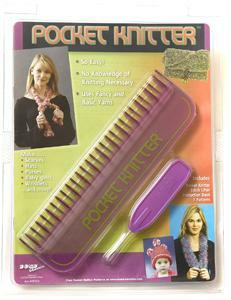 The Pocket Knitter is just the answer! This unique tool, invented by USM-inventor Roger Curry, makes knitting your first scarf a breeze. It uses chunky or bulky yarns—or 2 to 3 strands of a thinner yarn held together—and can use all those challenging-to-knit ribbon yarns. You can do stockinette stitch or knit-purl combinations, stripes, intarsia, Fair Isle, loop stitches, sew-as-you-go for wider pieces and more than can be listed here! It has 14 knitting "fins" and uses a simple wrap-and-lift-off technique. Know someone who can't quite figure out knitting needles, but wants to create beautifully knitted scarves, purses and more? Then pick up our new Pocket Knitter for instant results. Knitting with the Pocket Knitter is so easy to learn, you'll be knitting your first scarf—without needles—in minutes! Instruction book with 7 patterns. Colors may vary.